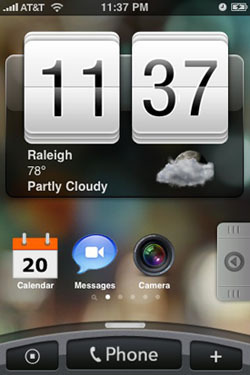 iOS 5: What Do You Want to See? In a previous life, I managed an iOS-focused site. Now, one of the glorious things about working at TechnoBuffalo is the ability to explore the bigger tech universe, but it’s hard to break old habits. Since I’ve gotten questions about what we could see in iOS 5, I’m going back to the old stomping grounds and throwing down my take on what is (and isn’t) on the menu for the next major software update. Some of these come from recent rumors while others are simply sorely desired (and even longstanding) wish list items. With the iPhone 5 possibly arriving in the fall, and WWDC (World Wide Developers Conference) emphasizing a software focus, let’s dive in and see what iOS 5 could be packing. This one’s a no-brainer. Cupertino basically reworked its Apple TV into little more than a cloud terminal, didn’t it? The company also bought Siri, a developer that figured out how to work off-site services into an extremely elegant application. And word has it that Apple is even building a mongo data center in North Carolina capable of handling a monstrous load like the iOS userbase. So it would seem that Apple is clearly interested in cloud services. But even if it wasn’t, it would likely be aware that others are: Amazon has already gotten cloud-happy, and word has it that Google is looking into media locker–type services too. iOS 4.3’s Home Sharing capabilities is a great start. Hopefully soon, along with the planned Find My Friends and Media Stream features, we’ll also see more robust iTunes cloud services. And while we’re at it, here’s a related subsection of cloud services that really warrants more pitchforks and torches in the Cupertino parking lot: Wireless syncing. 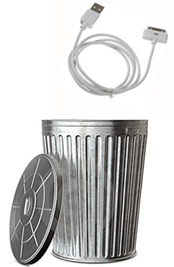 (Is anyone else sick and tired of hunting down that white cable?) Thanks to Cydia’s Wi-Fi Sync, jailbreakers know that it’s more than possible to sync our content to our devices without that blasted wire. Now, in light of cloud service getting some attention, Apple might finally be recognizing it too. It’s not a lock, but it’s very possible that some black turtleneck-sporting, jeans-wearing execs could be giving this one a green light. Using your phone to pay for items with a single swipe, or connecting to other iOS devices to share info easily, seamlessly — this is the promise of NFC. 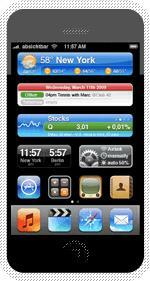 Whether the next iPhone will offer this remains to be seen. But if it does arrive, we’d love to see open developer access to this feature. How likely is that? To be honest, I’d bet that this won’t arrive in any meaningful way until at least iOS 6. It simply doesn’t have the demand or saturation level to warrant the huge undertaking that an immediate launch would require. Sorry, NFC fans. I doubt it’s coming this year. Absolutely, positively not. Sorry. If you’re a phone geek, you’re already aware that Apple, i.e. Steve Jobs, absolutely abhors Adobe Flash, considering it a messy resources-draining bit of antiquity, despite its preponderance on the webs. If you’re not a phone geek, then let me break it to you the best way I know how: “Snap out of it! [*slap slap*] It ain’t gonna happen.” Sorry for not being gentle. Consider it tough love. Maybe this ought to be in a separate hardware post instead, but it’s so anticipated, I’m throwing it in here anyway. 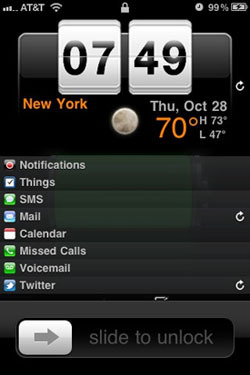 (Plus, if the iPhone 5 features this, the software would need to support it, no?) But sorry, boys and girls — 4G support is extremely unlikely, at least by summer 2011. The chances go up a little if the handset debuts in September, as the rumors suggest. Having a little extra time to work out the battery issues that a power-hungry, next-gen network could induce would surely help. But even then — I still don’t think the 4G coverage will be widespread enough to make this a high priority item … at least for now. Let’s face it: iOS is looking a little long in the tooth, isn’t it? Yes, the folders help bring some organization to our homescreens, not to mention the multitasking bar, but that same old app grid is getting pretty stale. Left to its own machinations, Apple would probably leave things be for a while longer. After all, the look and feel of Mac OS X has been going on for even longer than iOS. But competition is getting stiffer, and its mobile devices (though still hugely popular) aren’t really innovating forward anymore. In fact, it’s got some catching up to do in some important areas, both hardware-wise and software-wise. Nothing says revolutionary change more than a revamped UI — it’s the first thing users will see and feel. So I think the platform absolutely needs a facelift, and it will probably get it along with other changes. The only question is whether it will be in iOS 5 or 6. Enhanced lock screen. Imagine: A screen that houses all of your major alerts or other data would be really useful, wouldn’t it? If iDevice users won’t be getting widgets (see below), then this would help make up for that, at least for the non jailbreakers out there. (The Cydia-loving masses have packages like LockInfo.) Again, probably not super high on the priority list for Cupertino, but this wouldn’t be a difficult tweak to deliver, as LockInfo and other illicit apps prove. So I could see it possibly coming along for the ride with other major changes, to give the UI a fresher feel. User profiles. The need for user profiles wasn’t big back when iPhones and iPod Touches were the only gadgets rocking that little “i.” But things have changed. Apple dipped a toe in the fragmentation pool when the iPad got introduced, resulting in 2010 being the year of iOS trying to tame the various devices. Eventually, things finally got under control when 4.2 finally brought all the gadgets under one umbrella late last year, and now we have one version of iOS to rule them all. This is significant. Unlike phones, which tend to be under one user’s control, tablets are often shared in households. There’s no way this has escaped Apple’s attention. At some point, its devs will enable user profiles, just like it does in Mac OS X. And I’d wager, whenever it is that they pull the trigger on this feature, all iOS users will get the functionality as well. User-definable dictionary. There are ways to add things to the dictionary, particularly if you have other languages enabled, but they are neither obvious nor elegant. 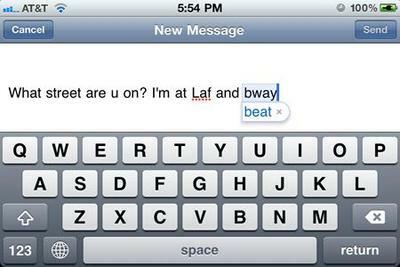 That’s why so many iOS users still deal with irritatingly absurd autocorrect fails. (There’s even a site dedicated to that.) Sure, Apple is a little… ahem, strict when it comes to its closed eco-system, but could it remain so rigid as to keep users out of their own smartphone dictionaries? Well, it has so far. But like the UI tweaks, this wouldn’t be such a hard thing to include, and it would please an awful lot of users. FaceTime over 3G. I don’t want to say, “Liar, liar, pants on fire,” but Apple’s promise that FaceTime would work over the cellular airwaves hasn’t exactly panned out yet. Then again, it may not be the company’s fault. It’s possible that 3G vid chat is so miserably bad that Apple just can’t abide it. 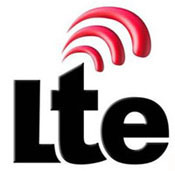 If that’s the case, FaceTime may stay tethered to Wifi until more 4G markets open up. In other words, it could be the white iPhone 4 syndrome, with Jobs & Co. not wanting to knowingly release it with big flaws. 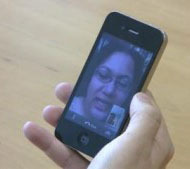 But there’s another side to this — Apple has very publicly promised 3G FaceTime. Would it be willing to stand yet another PR flop by re-negging? Hard to say. I think it’s possible that it will come, though it’s not quite probable yet. Widgets. This is among the top 2 things that has me drooling whenever I see an Android device. Of course there are limits. (MotoBlur anyone? Yech. Sorry, not my favorite.) Perhaps a nice Sense-ish implementation could give the aging OS some new life. Sure, this wouldn’t be innovating forward — more like borrowing from an existing UI that gets it right — but hey, I wouldn’t quibble. Offer some pretty-looking auto-updating widgets, and you’ll have some happy users on your hands, Apple. Jussayin. Better camera app. We can’t share photos with our social networks or tweak finer settings with the native app? Is this 1999? Please. We live in a media-obsessed culture. Sharing is vital. 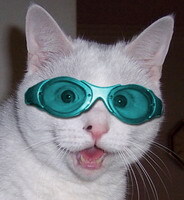 So is taking pics of our cats in goofy goggles, so let us change the white balance on Felix, k? Thanks. The most anticipated on the list are cloud services, and this one area could change things up substantially. Moving media storage off the device and letting off-site computation replace a lot of local processes would free up system resources. That means the limited hardware of smartphones would no longer be quite so bogged down, and could get a sudden boost to potentially work faster and better. But as with anything good, there’s also some potential bad. With more emphasis on the cloud, data traffic will need to be watched even more carefully, especially with the carriers’ penchant for data capping and tiered plans. For example, I know people who excitedly watched a ton of Netflix movies when they first got their iPads — only to face a wallet-slapping bill shortly after. Do you agree or disagree with any of these predictions? 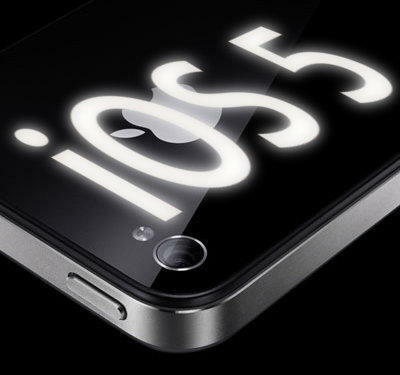 What are you looking forward to (or hope to see) in iOS 5? Let us know what’s on your wish list by chiming in below. And if you’ve got a few iPhone 5 desires, feel free to deposit them in the comments as well. 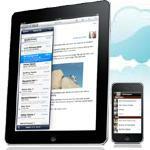 Be sure to check out our iOS 5 wishlist from a developers perspective and Jon Rettinger’s video wishlist of features.